An exciting new museum is under construction in Washington, DC. In November 2000, Congress and President Bill Clinton authorized the building of the National Law Enforcement Museum on federal land. The Museum held its ceremonial groundbreaking in October 2010, which was followed by 13 months of underground infrastructure work that took place while the Museum worked to secure construction financing. In April 2016, construction began at the Museum site at Judiciary Square and across from the National Law Enforcement Officers Memorial, the nation’s monument dedicated to peace officers killed in the line of duty. The National Law Enforcement Museum at the Motorola Solutions Foundation Building is scheduled to open in the fall of 2018. Over the last several years, many members of the law enforcement community have worked tirelessly to ensure that the Museum accurately depicts the past, present and future of law enforcement and tackles difficult issues that law enforcement officers often face. The Museum’s Stand With Honor campaign is an important element in bringing the Museum to life and will highlight the stories of its Honor Alliance members. These stories of heroism and courage are important in providing visitors with a better understanding of law enforcement and underscore their passion and empathy. When completed, the Museum will serve as a living legacy to law enforcement. In addition to honoring the history of law enforcement, the Museum will teach visitors about the profession while showing them what it’s like to walk in the shoes of the men and women who serve. It will also provide a space for a range of voices to come together to discuss and forge a mutual understanding on relevant law enforcement issues of the day. Substantial progress has been made but the Museum needs the help of the entire law enforcement community to make it a success. 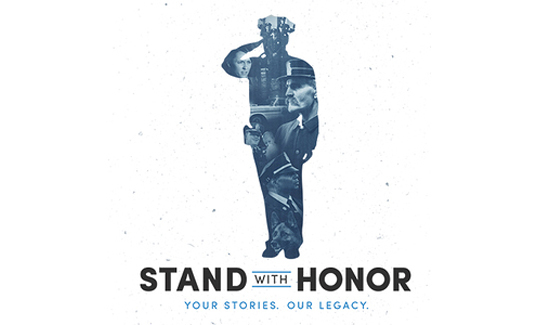 The Stand With Honor campaign has been launched to ensure that the stories of all law enforcement officers are told in the Museum. Show your support, visit StandWithHonor.us and join the National Law Enforcement Museum’s Honor Alliance. When you join the Honor Alliance, you are helping to ensure that your legacy and that of your fellow officers is preserved. The Museum will collect as many real stories of honor from law enforcement officers as possible in order to share their dedication and sacrifices with the Museum’s visitors. Many of those who have joined the Honor Alliance have done so on behalf of a friend, relative or colleague as a gift or in memoriam. Whether you join the Honor Alliance yourself as an active or retired officer; give it as a gift, or in memoriam, or join as a law enforcement organization, the Honor Alliance is a testament to making the Museum a place that represents America’s entire law enforcement community. The National Law Enforcement Museum is a place where officers can make a difference in telling the story of law enforcement history.